In 2005, The United Nations launched its Decade of Education for Sustainable Development, which recognises that education, including Higher Education is the key to the change in social attitudes that will be needed to protect the welfare of future generations. This involves helping learners to live as though the future matters and to achieve ecoliteracy. This includes the understanding that personal lifestyle decisions may have consequences, ranging from climate change, through loss of biodiversity, to pollution and resource depletion that may permit environmental degradation on a planetary scale. It also involves helping them to develop the skills needed to cope with such challenges. 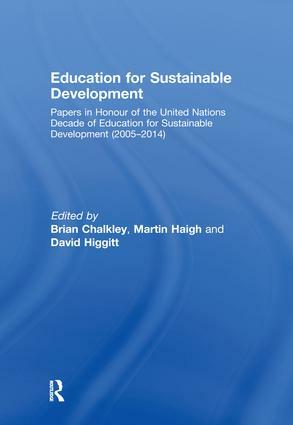 This international collection of research papers and position statements from special issues of the Journal of Geography in Higher Education and Applied Environmental Education and Communication, written by many of the leading practitioners in the field, aims to provide resources and practical guidance for all seeking to promote and engage in education for a sustainable future. Rabindranath Tagore encouraged each learner to make their actions demonstrate a harmonious union between education and environment. David Orr argued that the world needs people who live well in their places to make the world both habitable and humane and that the main challenge for education is to help learners make their minds fit for life on Earth. This book tries to chart a practical route towards these objectives. Brian Chalkley is Director of the Higher Education Academy Subject centre in Geography, Earth and Environmental Sciences at the University of Plymouth, UK. Martin Haigh and David Higgitt are Co-Editors of the Journal of Geography in Higher Education and Professors at Oxford Brookes University, UK and the National University of Singapore, respectively.